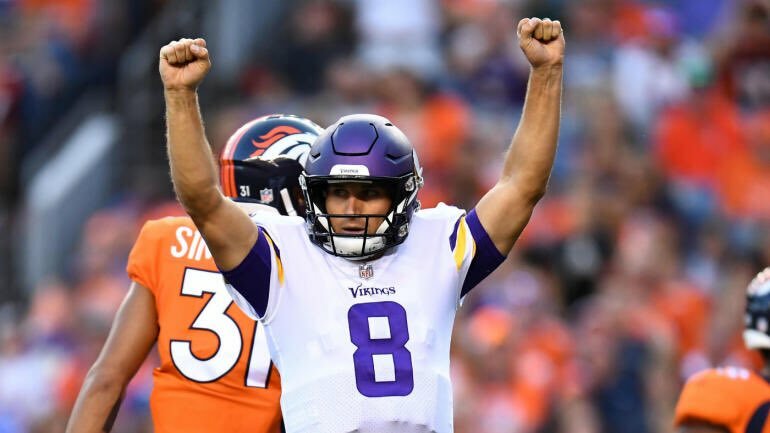 Fans were treated to one of the more interesting matchups—as far as preseason action goes—Saturday night with the Denver Broncos taking on the Minnesota Vikings. It was the first time Minnesota fans would get to see their new starting quarterback, Kirk Cousins, in action. Minnesota’s former starting QB, Case Keenum was making his debut for the Broncos. Oh—and Trevor Siemian and Kyle Slotter, both former Broncos QBs, were making their debut with the Vikings. Kirk Cousins only had one drive on the night. But for the first preseason game, it was all the coaches needed. He didn’t look like a quarterback taking the field with his team for the first time. He looked like an experienced vet as he guided the team downfield, going 4-4 for 42 yards and a touchdown. “I think it was a smooth first drive, but it is a small sample size and the next couple of weeks will be a good test for us,” Cousins said. The Vikings offensive line was missing two starters but still looked pretty good. Kirk Cousins wasn’t sacked, and Latavius Murray had some good running lanes. Depth on the o-line can be the difference between winning the division and making the wild card game. If Cousins goes down, it appears that Trevor Siemian or Kyle Sloter could be up to the task of stepping in. They were only playing Denver’s reserves, but they looked great in the process (Siemian—11-17 for 2 TDs and 1 INT; Sloter—9-11 for 69 yards and a touchdown). Dalvin Cook didn’t play, but Latavius Murray ran well (four carries for 43 yards). Roc Thomas showed off some impressive speed when he took a screen pass 78-yards for a touchdown. Case Keenum did not look good. To be fair, he only played two series, both of which were three and outs. But a penalty killed the first. On the other, Keenum struggled against the pressure the Broncos D put on him and made bad throws. It’s too early to make any snap judgements on Keenum. His o-line did not do a good job of protecting him. But with how Paxton Lynch played, he has nothing to worry about (6-11 for 24 yards and an interception). However, if Keenum were to continue to struggle and Chad Kelly continues to play well (14-21 for 177 yards, two touchdowns, and one interception), the fans may call for a change. His 36-yard touchdown pass to tight end Matt LaCrosse was a thing of beauty. He looked like an old vet on an 11-play, 85-yard drive late in the game. Royce Freeman didn’t play much (four carries for 38 yards and a touchdown) and most of his yards came on one carry (23-yard touchdown run). But that one run looked very promising. While the Vikings first-team offense moved the ball easily on the Denver defense, once Cousins and the other stars took a seat, they got it together. Bradley Chubb is going to be fun to watch but he has some work to do against the run. Zach Kerr made some plays as well. For those that keep score in the preseason, the Broncos won the game, 42-28. Denver will face the Chicago Bears in Week Two of the Preseason Saturday night. Minnesota will take on the Jacksonville Jaguars, also on Saturday night.